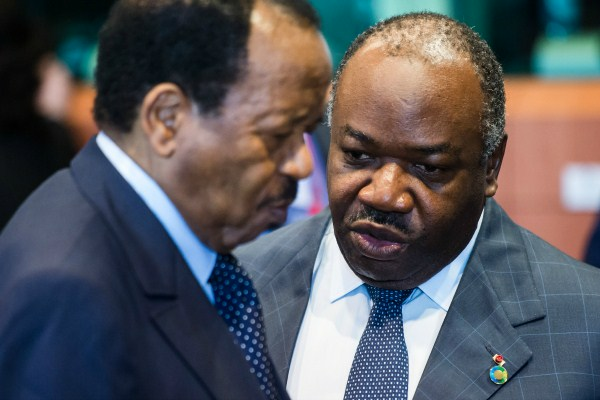 Cameroon President Paul Biya, left, talks with Gabon President Ali Bongo Ondimba at an EU Africa summit at the EU Council building in Brussels, April 3, 2014 (AP photo by Geert Vanden Wijngaert). Gabon hardly ever makes headlines outside of the French-language press, so it’s little surprise that the storm brewing over this small, oil-rich country on the west coast of Central Africa for the past few months has received little attention. Yet all indicators point to political turbulence ahead in the run-up to Gabon’s next presidential election, which is scheduled for mid-2016, given a series of protests and strikes, including a teachers’ union strike that has paralyzed Gabon’s education system since February. The growing social unrest has affected Gabon’s economy, with its health, petroleum and telecommunications sectors all feeling the impact; in late February, a strike by Gabon Telecom employees cut the country off from the Internet for 48 hours.